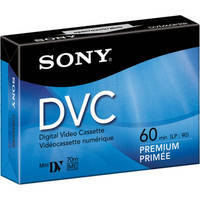 The Sony DVM-60PR 60 Minute Premium Mini DV Video Cassette is made for DVC camcorders. The tape features Metal Evaporated tape, a Diamond-like carbon coating protective layer which improves durability and helps prevent shedding and drop out. Order 50 tapes or more and get a free expedited delivery!